Serpstat is a swift and effective way to improve the growth level of your existing business. It is a platform designed for Search Engine Optimization and online growth of any business. Serpstat consists of an analytics system which helps you to know what your competitors are up to and what you need to do to increase the ranking of your business in an industry. The checklist is a new Serpstat tool that will help you to develop and improve your projects. The checklist will enable you to monitor the process of project tasks. It consists of ready templates with many options. You can add your tasks in it and its simple and easy to understand structure will explain the optimization process to anyone. You need to buy the subscription package of Serpstat to utilize this tool. A checklist can be added to an existing Serpstat project only so you need to create it first if you don’t have it. The list of projects and checklists will work together. People in Business: Businessmen usually have no idea from where to start their business. The checklist can help you to promote and optimize your projects by using their templates. PMs: Checklist can help you by monitoring all of your team member’s work and will keep track of work in progress. SEO Studios: Checklist can help you set tasks for each one of your project and can optimize your work as a topic, site, and product classify the projects. Serpstat will monitor their progress and will ensure the project’s fulfillment for you. SEO Specialists: Checklist helps to manage your effectiveness. The checklist will remind you what you have already done and what you have to do. Serpstat helps you to get all the details about your backlink strategy within just a few seconds. With only one click, you can get started with it along with getting a list of all your anchors, referring pages and domains. It allows you to have a track of your backlink data for around 4 months and also tracks your competitor’s strategies simultaneously. Serpstat helps you to understand the results of your marketing strategies. They have an effortless and easy to understand dashboard that shows all the insights of your latest campaigns, and you can also track your performance here with just a few clicks. There is also an option of email alerts to inform you regarding the changes in your domain and changes your information into charts and diagrams. If you wish to show your Return on Investment (ROI) of your marketing campaigns to your teammates, Superstat will enable you to download the results into customizable reports which will contain the name of your brand, logo, strategies, SWOT Analysis and more. Superstat is the best way to monitor your rank in the search engine’s result pages. You can have details about all the top results of the keywords that you have selected and can check who is competing and beating you sharply by acquiring the number one position. You can also check how your keywords are ranking on a daily basis. If you want to get the complete details of your campaigns, then you can search it independently for specific groups and can add more members into the team for getting extra insights and opinions. It is essential to keep track of your competitor’s strategies and activities to improve the results of your industry and to perform and strategize better than them. Serpstat will provide you with beneficial information about your competitors, and you can use this to modify and plan your decisions in the company. Serpstat will help to identify your top competitors, and you can make use of Serpstat domain v/s domain comparison tools to know where you need to grow and improve. Serpstat can analyze 200 domains at once, allowing you to have a detailed list of your existing competitors. You cannot develop a successful SEO strategy without conducting keyword research professionally. The overview dashboard is elegant and clean and will show the critical data to you all at once. Here you can collect keywords for PPC and SEO campaigns that will most probably generate good results along with a list of favorable terms which are already reliable. You can also determine the values of keywords. 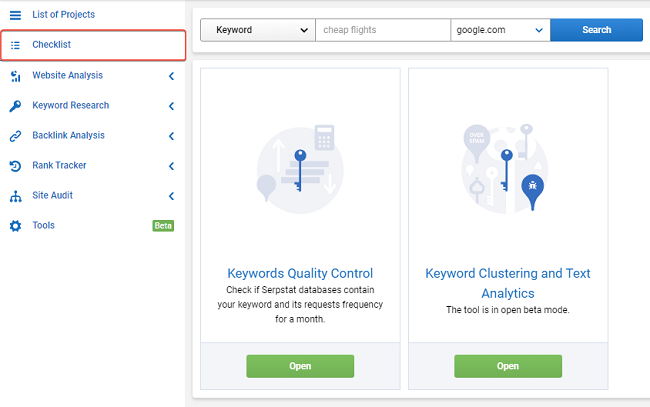 There will be search queries reports that will provide you with phrases from Serpstat database that will match with your keyword. Keyword difficulty will evaluate the level of competition for a particular search team. This will save your time to know the keyword difficulty. Serpstat can provide you unique and innovating ideas and tips for writing good content for your industry. If you are out of ideas and have no clue about what to improve in your existing content writing plan, then related keywords will surely help you. You can also have a record of the number of shares that your content will get on Facebook, WhatsApp or any other site. This will give your team members an idea about the popularity of your content and will show you how engaging and entertaining your posts are. You can also check the traffic on each website, and this will help you to take better decisions about your posts to know which posts need to be updated with better quality and which ones can be promoted as it is. The checklist is available on the left side of the toolbar. You can only add Checklist in an existing Serpstat project, and if don’t have it, you need to create it first. In the below image, you can see how to add a checklist to an existing project. Also remember that list of projects and checklist work together. When you add a checklist in a certain project subgroup, the list created will be divided as the list of projects is divided. While creating checklists, you can make use of Serpstat templates or can develop your templates by clicking on “My Templates.” Below images are available for you to preview this. Template preview will show you the number of tasks done and a short description of the template and its categories. Technical: to check and adjust the technical parameters of a project. Content: It maintains the quality and optimizes the project’s content. Links: It verifies and optimizes links of all the projects. Business Analysis: It takes care of analyzing the niche, planning the internal activities of the project. Other project parameters: It includes monitoring, reputation, branding, social factors and regional settings. You can have templates in Checklist by two methods. First, if you created it from a scratch or a serpstat template. If you make any changes in serpstat, you save them in an old list or a new template list. There is also a search box on the checklist. It can show you all the results found in yellow and grey color. • There’s a free trial plan. • It provides insights into SERPs. • The keyword difficulty score is complex to understand and is skewed as compared to other tools. You can get Serpstat at very affordable prices which will be under $100 a month. Premium subscription plan will start at $19/ month, and you can avail discount on this by choosing the yearly subscriptions. You need its plan B to use all its features fully. Although it is also available for free but is limited to 30 searches a month. Checklists will make it very easy for you to watch the optimization of your website and it will save your time and efforts while planning the strategies for your site. Its templates will help beginners greatly to understand its process. The checklist is one of the best SEO platforms available, so I undoubtedly recommend it to all.